Get 100 percent completion while unlocking all endings for Partners in Detroit: Become Human. 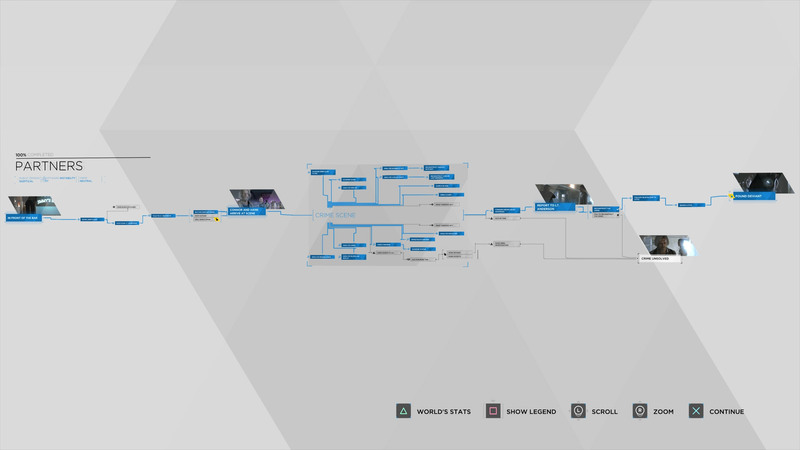 This walkthrough will outline 100 percent completion requirements and all endings for Partners in Detroit: Become Human. That includes finding all 10 pieces of evidence and making the right conversation choices between Connor and Lt. Anderson in Jimmy’s Bar at the start of the chapter. The 100% complete flowchart for Partners. There are two distinct paths that players can take during the Partners chapter. All lines will lead to either a success or failure with regard to the case at hand, but players who want to earn 100% completion will want to make sure they hit all the biggest investigation highlights before running out of time or before being pressed for time by Hank. This ending is unlocked if players enter the house and analyze all the clues. This will include reconstructing the crime accurately for Lt. Anderson, following the blue blood to the attic, then searching the attic and finding the deviant. Truthfully, this ending will take place if players just show up and try, as failing this mission turned out to be harder than passing it. This ending can take place under a few rare circumstances. First, if Conner spills Lt. Anderson’s drink at the bar, then shows up at the house and does nothing for several minutes, Hank will leave and won’t give Connor more time. Players must literally stand around and do nothing to get this to pop. The second way to get Crime Unsolved would be to miss huge amounts of evidence and then fail to reconstruct the crime accurately. After finishing Partners with 100 percent completion and all endings unlocked, proceed to Stormy Night or browse through all chapters with our Detroit: Become Human 100 percent walkthrough. We’ve done the work to earn 100 percent completion on every chapter and unlock all the endings.